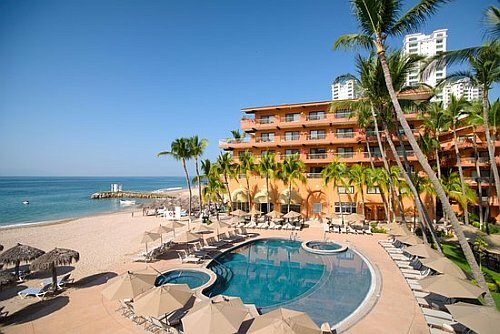 Transat is showing a last minute 7-night flight and hotel package from Montreal to the Villa Del Mar Beach Resort And Spa in Puerto Vallarta, Mexico for $498 CAD including taxes. 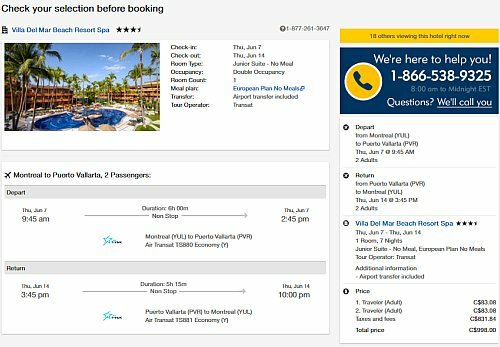 A non-stop flight from Montreal to Puerto Vallarta generally goes for a minimum of $500 CAD roundtrip alone. You are essentially getting the hotel thrown in for free. The flights from Montreal to Puerto Vallarta are non-stop both ways. The hotel involved with the package is the Villa Del Mar Beach Resort And Spa. It has 4 circles on Tripadvisor with 41% rating it as Excellent. NOTE: Once you get to the search results page, use the 'Search by hotel name' pulldown menu and select the 'Villa Del Mar Beach Resort And Spa'. montreal, yul, mexico, north america, flight and hotel packages, villa del mar beach resort and spa, puerto vallarta, pvr and transat.